The book with no name (yet). An unexpected surprise for me last Friday. 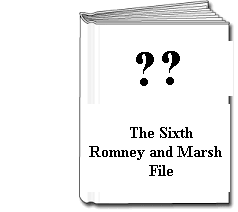 I finished the first draft of Romney and Marsh File #6. Finishing the first draft of a book is always a special moment – something to savour and celebrate. I hadn’t been planning to finish it so soon. But after chipping away at it for a couple of weeks with some resolve.I got the chance for a few days feverish activity and it sort of came together. Presently it’s weighing in at ninety-six thousand words, which makes it the second longest R&M File and only a couple of thousand words shy of Particular Stupidities. I can’t share the title yet because I don’t have a clue what to name it. That’s not happened before. Usually I have some ideas. I’m a bit worried. When I started with my self-publishing venture I resolved to reply to any comments I received on both Amazon UK and US sites. It seemed the right thing to do. And I did. Well over a thousand. With the release of Particular Stupidities in the summer I stopped the practice. I didn’t consciously decide to stop. It just sort of ground to a halt because I was on holiday for six weeks and then living out of a suitcase in a flat without Internet for a couple more. A backlog of comments built up on all the books and instead of putting aside the time needed to answer them all I decided not to. I am still very grateful for all the positive comments I receive. I read every one. I’ve learned a lot from readers’ comments. I’m sure I’ll learn more. I wouldn’t want anyone to think that I don’t value the time and trouble readers put into their feedback, or that I think I’m above it now. I’ve started another blog since I’ve been in Ankara. It’s about me teaching my son to read. I’m only mentioning it here because the first four weeks are now complete. I don’t expect it to be of any interest to my regular readers but if there are any of you who know someone who is looking to help their pre-school child to read or just get familiar with the sounds there might be something helpful in it. Can’t wait for the next Romney Marsh book.Don’t care what it’s called. I am looking forward to reading the new release whenever it comes out, You have been one of the finds for me this year. You write some good stuff. Keep it up. Thanks, David. Still a bit of work to do on it yet and then the proofreading. And thanks for your kind words and support. Just finished Particular Stupidities and loved it although I thought the start was a little slow,unusual for your books. Can’t wait for your next book and for your next Samson book, I know I keep beating the same drum! Thanks for dropping by the blog. Good to know that you enjoyed PS. I really want to write Acer #4 but I’m finding that I must prioritise with the books that sell best for me now that I’ve given up the day job. I’m going to make a determined effort to get to it before next summer.